One of the saddest things I have encountered during nearly 20 years of practice in the field of legal ethics and professional discipline is the demise of a career in law — literally, someone’s life work — because of sloppiness, ignorance, or the inability to properly manage escrow funds. Despite all of the CLE courses, the multi-state professional responsibility exam, reported disciplinary decisions, and other publicity, some lawyers still do not grasp the proposition that running a law office entails managing a small business and properly handling trust funds. In any case, all attorneys, but certainly every lawyer planning to open a solo or small practice, must study and absorb the basics of fiduciary accounting. Fortunately, everything you need to know is contained on one disciplinary rule (DR) of the New York Code of Professional Responsibility: DR 9-102. Here, in a nutshell, is a summary of the most important concepts that must be understood and implemented to avoid violating DR 9-102 and suffering the possible disciplinary consequences. The first and most obvious principle of fiduciary accounting is the segregation of personal or business funds from escrow or trust funds. Escrow funds include monies entrusted by a client or funds given to a lawyer by a third party to hold in escrow, e.g., such as a real estate deposit to be held by the seller’s attorney. In either case, DR 9-102(A) explicitly prohibits commingling of any such funds with the lawyer’s own money. The rule further requires that the lawyer or the lawyer’s firm managing escrow funds must label the special bank account where the escrow funds are held as an attorney special account,attorney trust account, or attorney escrow account. See DR 9-102(A)(2). The question sometimes arises whether lawyers may properly escrow advance fees. The short answer in New York (a minority jurisdiction on this issue) is: yes, but it is not required. If an advance fee is placed in an escrow account, the lawyer who decides to do so must scrupulously withdraw the funds as earned so as not to leave earned fees mixed in with other client or third party funds, the result being commingling. The importance of careful record-keeping also cannot be overemphasized. Lawyers who intend to hold client or trust funds must understand that it is simply not enough to maintain a separate escrow account and then run it out of a checkbook (another very commonly observed phenomenon). DR 9-102(C)(3) expressly directs lawyers to do substantially more than that. It requires that lawyers maintain complete records of all funds, securities, and other properties of a client or third person coming into the possession of the lawyer and render appropriate accounts to the client or third person regarding them. The reason for this should be obvious. If the need for an accounting ever arises, a lawyer holding trust or client funds must be able readily to identify the source of every deposit and purpose of every withdrawal. Proper recordkeeping ensures that escrow funds will not get lost or inadvertently misused. 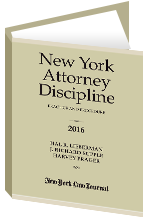 In order to implement DR 9-102(C)(3), in or about 1990 the New York courts added an explicit recordkeeping rule to the Code, DR 9-102(D). This rule requires, inter alia, that a lawyer’s financial records be maintained for seven years, including records of all deposits in and withdrawals from escrow accounts, copies of all retainer agreements, statements to clients showing disbursements, bills rendered to clients, retainer and closing statements filed with the Office of Court Administration, and payments to other lawyers or investigators made on behalf of a client. Additionally, the rule requires retention of all checkbooks, check stubs, bank statements, deposit items (copies), duplicate deposit slips, and any pre-numbered cancelled checks. In short, the rule obligates a lawyer to keep available for seven years virtually every piece of paper related to any escrow transaction! Again, shockingly, far too many lawyers simply do not retain these documents, which conduct, in and of itself, constitutes a violation of the rules. See DR 9-102(J). But worse still, too few small firms and solo practitioners approach financial recordkeeping with the care that is truly required. Although data may now be electronically stored, and software programs such as Quicken are readily available to assist in accurate recordkeeping, even handwritten ledgers are not employed, nor bank statements reviewed and reconciled on a monthly basis. Yet, DR 9-102(D)(9) specifically requires that lawyers make accurate entries of all financial transactions … in their ledger books or similar records … which entries shall be made at or near the time of the act, condition, or event recorded. The danger of not maintaining a ledger, and simply running an escrow account out of a checkbook, is plain to see. By not making accurate and timely entries of receipts and disbursements as to each client or third party, with a running balance, a lawyer can easily, albeit mistakenly, use one client’s funds to pay another client’s creditor. This constitutes misappropriation of client funds, pure and simple. But even if there is no inadvertent misuse by robbing Peter to pay Paul, the danger of bouncing an escrow check — automatically triggering a disciplinary audit — is so great when accurate records are not kept that no lawyer who fails to keep good records should be surprised when that happens. And lack of intent will not constitute a defense. We are talking here about what is essentially a no fault rule that is clear and long-standing. See Matter of Collins, supra. Funds belonging partly to the lawyer and partly to someone else — e.g., real estate proceeds, insurance settlement checks — must be deposited in a trust account. A lawyer should withdraw the lawyer’s portion when earned, and either disburse the client or third-party portion or leave those funds in the trust account if so instructed. In the event that a client or third party disputes the lawyer’s right to withdraw any of the funds, then the lawyer must leave the disputed portion (but only that amount) in the trust account until the disagreement is resolved. See DR 9-102(B)(4). Unfortunately, sometimes clients will dispute a lawyer’s fee and then sit on their hands. It is important not to get frustrated and simply remove the funds from escrow. Rather, in such circumstances the lawyer should take affirmative steps to get the matter resolved by offering fee arbitration, seeking a judicial determination, or otherwise requesting the client’s cooperation in negotiating a fair solution. See Ethical Consideration (EC) 2-23. The respondent apparently left the handling of the escrow account to his partner because the partner handled real estate work which entailed use of the escrow account and the respondent basically handled the criminal cases. There is no question that the respondent failed to review the financial and bookkeeping records of the law firm until he discovered the irregularity in 1985…. [T]he respondent is guilty because as a partner in the law firm, he had a responsibility to oversee his partner’s handling of the escrow account. The obligations of law firms to supervise their partners is also now expressly codified in another provision, DR 1-104, which directly imposes supervisory duties on partners vis-C–vis one another. Escrow checks cannot be payable to cash. I am continuously troubled by the fact that after 12 years on the books DR 9-102(E), the rule prohibiting lawyers from writing escrow checks to cash, or making cash (i.e., ATM) withdrawals from trust accounts, is still frequently ignored. The reason for the rule is evident, and goes back to the notion that careful records must be kept as to all fiduciary financial transactions. Withdrawing funds from escrow without designating a payee makes it virtually impossible to ascertain the purpose of the transaction, or whose funds are being used. Please don’t do it. Because the proper handling of other people’s money is so vital to the maintenance of the reputation of the bar in the eyes of the public, our courts and grievance committees are very impatient with lawyers who violate fiduciary accounting rules, even unintentionally. If you take away nothing else from this article, just carefully review all of DR 9-102 and call a specialist or an ethics hotline if you have any questions at all about how to manage client or third-party funds. Reprinted with permission from the November 10, 2003 edition of the New York Law Journal ©2003 ALM Media Properties, LLC. All rights reserved. Further duplication without permission is prohibited. For information, contact 877-257-3382 – reprints@alm.com or visit www.almreprints.com.